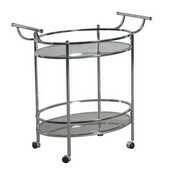 Kitchen Carts from Powell provide an attractive solution for kitchen storage, with practical designs and a variety of convenient features. 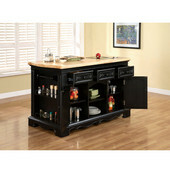 The kitchen carts are made of solid rubberwood and feature enclosed storage with two-door cabinets. Many of the carts have a Black granite cutting board and towel racks on either side of the cart. Shelves and drawers keep kitchen essentials in order. 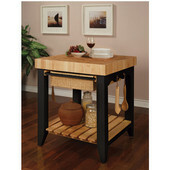 Drop leaves on the Noble Oak Kitchen Cart, back leaves on the Medium Oak and Antique White Kitchen Butler(R), and slide-out cutting boards on the black and Hand Painted Rooster Kitchen Cart add extra workspace. 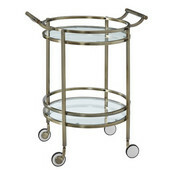 Casters give you the freedom to move the kitchen carts wherever you wish.